NOTE: Links to this website from other sites should not be used to infer any endorsement of either information on that website or of any product. This website is not sponsored by any manufacturer, organisation, government agency or private individual. This website is independent of any other site, brought to you by Lanfax Laboratories of Armidale NSW. NOTE: Laundry products may have been modified by manufacturers since these products were tested in 2009. New products may have replaced older products and new names may have entered this highly competitive market. PHOSPHATE-FREE DETERGENTS: maybe this is good news to some but not to others. The alternatives to phosphates as builders in detergents have not been tested for their effects upon soil. I am mindful that the alternatives are generally artificial zeolites (Zeolite-A) which is an insoluble in the laundry detergent. Will your wash and rinse performance be capable of removing this insoluble material? Will the insolubles harden in the plumbing and sprinklers of your greywater system? Where are the answers? I know that zeolites will settle out of laundry water - it happened in one of my research experiments. Removing phosphates from detergents has a distinct advantage where water authorities take the easy option and dump effluenf from sewage treatment works into clean river systems. The other advantage is that phosphates are non-renewable - one day they will become too expensive to mine. For those who irrigate greywater to soils, some phosphorus is good for the plants. Clay soils generally have an affinity to lock up phosphorus, but sandy soils have no such mechanism. Is the removal of 'phosphates' an advertising gimmick in itself? Sodium is a more serious problem for salinity and sodicity control. In my view we would be better putting efforts into reducing sodium. This research project commenced in 1986 and every four to five years the data were updated for the range of laundry products available through the supermarkets and more visible 'boutique' manufacturers. In recent years, Lanfax Labs and Choice collaborated in two research components, for powders in 2007 and liquids in 2008. The results of those tests were published in Choice (www.choice.com.au) and on this site (since removed). The most recent upgrade of results was in 2009 that replaced all previous data on both liquid and powder laundry detergents with data that reflected the products available in 2009 Since 1986, the number of standard laundry powders has dwindled and all except six of the 71 products selected for the 2009 round were concentrates. Those six powders did not indicate whether they were concentrates or not. Several products used terms such as "highly concentrated" and "ultra-concentrate" to convey some greater reduction in volume of product required. A printable brochure is available for downloading here (laundry brochure). The brochure shows the ranking of 42 front loading and 47 top loading detergents for sodium with phosphorus. The graphs are ranked on sodium (blue bars) with phosphorus (red bars) as a second bar under the blue bar. When in doubt about which detergent to choose, a low sodium with no phosphorus is a wise choice. Note: This brochure may not be used by commercial enterprises. It may not be attached to any item for sale. The brochure may not be altered in any way. Lanfax Labs does not endorse any product and no information contained in the brochure or any of these pages may be construed as endorsement or dissatisfaction with any product. The information is contained for consumer education and environmental awareness. Standard powders usually have a larger bulk than concentrated products, that is, a larger volume of standard powder is required for a normal wash than a concentrated powder. Some of the additional bulk in a standard powder is a "manufacturing agent" which in many cases is just a "filler" and takes almost no part in the washing action yet adds significantly to the overall salinity of the detergent. The ingredients in powder detergents fulfill several functions: to soften water, to immobilise agents that cause hardness, to break the surface tension of water, to alter the pH, to provide total alkalinity and to enhance to removal of soil and dirt. Depending upon the "dirtiness" of the clothes and the hardness of the water, varying amounts of detergent are required to wash the clothes to your satisfaction. Brightening and/or bleaching agents may assist that process. This research is not about individual components of a laundry detergent, but the potential effect upon land application of the discharge of the wash water. Popular brands of powder often came in different packs with subtle variations in labelling. 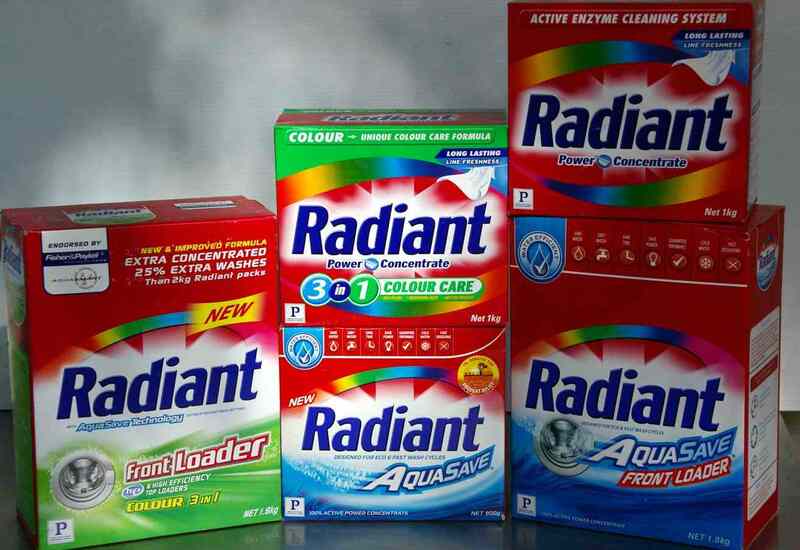 As an example only, Radiant (made by PZ Cussons) came as five different packets. Another example was Coles concentrates that simply distinguished the range of detergents to specific interests. Perhaps the greatest change to marketing of laundry detergents in recent years is the separation, in the supermarket, of products specifically for "front loaders" and "top loaders". 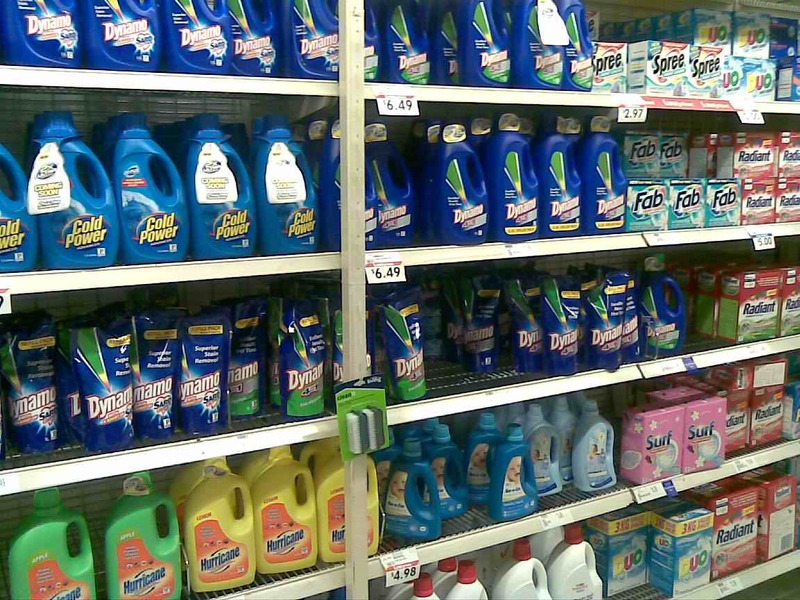 In the supermarkets, it is common for the two 'groups' of powder detergents to be separated by liquid detergents. When a product has 'front loader' clearly on the front of the pack, it is grouped with all other front loader powders. For products that do not have the words 'front loader', these are all grouped together and with products for "top loaders. For products that are suitable for both front and top loader machines, these products cannot be found in the 'front loader' section. It is my understanding that this separation of machine type powders is dictated by the supermarkets and not by the detergent manufacturers. I know that one manufacture has relabelled its product so that one carries the usual product labelling, and another its 'front loader' powder when the product in each pack is identical - simply labelled to meet the demands of the supermarket chains. It is not difficult to understand that confusion reigns in the area of detergent marketing. Claims that really stretch science are not uncommon and the use of catch-phrases or common jingle type statements are likely intended to appeal to either our "environmental awareness" or the need to have washing that is brighter than our neighbours. The term "greywater" appears regularly while the small print may say that only the rinse water should be used on the garden. The term "biodegradable" has a specific meaning, but that term is distorted when applied to laundry detergents. These, and other terms will be explained elsewhere in these pages. Manufacturers indicate that more product is required for 'hard water' but nowhere is there a description of 'hard water' as it relates to washing. That assumes that the recommended dose is for "soft water", but where does that apply? Even an Australian Standard for wash and rinse performance (AS/NZS 2040:1.2005) has set the hardness of water lower than many of the metropolitan consumers use thus distorting the ranked performance of washing machines under 'real' conditions. See the description under "hardness". Not only is there no consistency in labelling, clearly there are many inaccuracies and much vagueness. I suspect that much of the misinformation is to the detriment of the environment, either for on-site disposal or at the end of a community sewage treatment scheme. There are many cautions printer on the various brands that leads one to suspect that the products have the potential to be hazardous to one's health. "Keep out of reach of children" suggests a fairly unfriendly product, as does "seek medical advice" if ingested or contact the poisons information centre. Benefits such as "septic tank safe", "suitable for septic tanks" have no standards against which performance can be gauged. Since septic tanks operate as anaerobic (without oxygen) environments to provide primary treatment, it is unlikely that any modern detergent will have any detrimental impact on the performance of the septic tank. Septic tanks can work efficiently on sea water. The same cannot be said for the use of bleaches and chlorinated agents that reduce bacterial populations that provide an essential role in primary treatment of sewage. The problem that detergents give rise to are in the land application areas, to the soils and plants. "Suitable for greywater" and "greywater friendly-rinse only" need to be related to the land application area, since soil and vegetation types are the sensitive receptors. These impacts are discussed elsewhere under the various specific pages - pH, total alkalinity, electrical conductivity, sodium and phosphorus. This website suggests some threshold levels for these major chemical properties of wastewater, however, site variations mean that some judgement must also be applied to understanding the impact of greywater on soils and plants. As only organic compounds can be biodegradable, often the only components that can fall under this category may be the surfactants, the fragrance and the cardboard box. As most of the other ingredients are inorganic compounds (salts), they cannot, by definition be biodegradable. There is no acceptable standard for biodegradability, only a ranking of various levels of degradability. To be able to quote compliance with the Australian Standard (AS 4351), the product must be tested against that Standard, and if passed the term "readily biodegradable" can be used. For accuracy, the reporting should be that "the surfactants in this product are readily biodegradable according to AS 4351", since the other major components are 'inorganic salts' and can never be "biodegradable". The term "100% biodegradable" suggests that whole products is organic. In that case the electrical conductivity of the product in water should be the same as the water alone - scientific fact, since organic products do not dissociate to positive and negative ions. That the electrical conductivity of a product in water is higher than that of the water alone indicates that the term used is false. In the photo to the left the term "fully biodegradable" is conspicuous at the top left of the front of the pack. When the recommended dose (26.3 g/wash FL) is mixed with water, the electrical conductivity was 1.7 dS/m indicating a reasonable quantity of one or more inorganic salts in the powder. The product cannot be 'fully biodegradable'. Instead, the term "the surfactants in this product are biodegradable" should have been used, if the surfactants had been tested for that purpose. Other products that use the term "concentrate is readily biodegradable according to AS 4351" is contrary to the requirements of that Standard. Do you read the small print? How are you supposed to know what these terms mean? Where are the regulators - or are they equally confused? It is perhaps amusing that washing machines are sold according to the weight of clothes they are capable of washing successfully. I haven't met anyone who has a set of scales in the laundry and accurately loads the machine to its capacity. Certainly when I do the wash (me, a mere male), weight has absolutely nothing to do with it - nor does sorting clothes as my mother showed me resemble what goes into the machine. So how do we gauge the amount of laundry powder to put in with the wash? Except for a couple of products, there was no mention in the instructions as to whether one needs to alter the dose of powder based upon the size of the machine. Obviously it is irrelevant whether you use a 5 kg machine, a 10 kg machine or anything in-between. So, do we use the same 'scoop' irrespective of the size of the machine we are dosing? If so, then we are wasting powder. But the manufacturer does not relate the dose to any particular size of machine, so how are we to know what is meant? Does the manufacturer really understand the 'household' situation? NOTE: In the recent work by Choice (Nov2009), it is proven that reducing the dose of a top performing powder detergent to half the recommended dose had almost negligible effect upon the performance of the washing test. That in itself suggests that for many consumers, the recommended dose is at least twice what is required. If you use rainwater as the input, then reduction of dose should be normal practice, since rainwater has no hardness for the detergent to combat. A "normal wash" is an interesting description of dirty clothes. What is meant by "normal wash" or "normal load" is not described anywhere. Perhaps our understanding of what is meant by "normal wash" is a term we are born to know. Even the current Australian Standard (AS/NZS 2040.1) uses the term "normally soiled" without definition. But that Standard does require a dose of powder detergent according to the size and type of washing machine. I was pleasantly surprised to find that most of the products came equipped with their own 'scoops', while one suggested is was environmentally prudent not to provide a scoop with each packet (so when do you get a scoop? ), others relied upon the use of a tablespoon (20 mL), a cup (250 mL), an awkward wide lid (difficult to gauge portion of a cap). What became obvious was the differences in 'scoop' size and the wide range of implements. Figure O-1 shows the various size 'scoops' ranging from 18 mL to 117 mL. The identifying 'letter' was used to match the scoop with the products during the research when the mass of one scoop was required to calculate actual dose. Figure O-1 Range of 'scoop' sizes in the 71 laundry powders. The first part of the research program was to determine moisture (amount of water in a freshly opened packet), followed by a measurement of the mass of the scoop (or cup, spoon or other measure) for each product. Ever wondered why the products are sold by mass (kilogram) yet you use the powder by a scoop of unknown volume (or mass). I can understand why some manufacturers do not indicate the number of "normal washes" per pack - some products have very high dose rates (up to 128 g/wash), meaning that less than 8 washes/kg ....that could be expensive! Thirteen of the 71 products made mention of the number of washes per pack (assuming "normal wash"). With the impending requirement for "unit pricing" in supermarkets, it is not clear whether laundry products will change the way they display prices. Price per kilogram is a meaningless term when applied to these products and confusion is the order of the day. I have sought Government clarification, but have not received an answer (not holding my breath). From my recent observations in supermarkets (Jan2010), unit pricing is based upon cost per kilogram, so I was no wiser how many washes I got for my dollar. The measured doses of the detergent are shown in Figure O-2 as a frequency analysis (the number of products in each range -hence frequency). I think you have a right, as a consumer, to be able to estimate the number of doses per kilogram prior to purchase. After all, petrol is consumed by the volume (litres per 100 km) and also sold by the volume (litres). How would you be placed if petrol was sold by the kilogram. At least with the knowledge that petrol weighs about 780 g/L, you could do the mental arithmetic. However, how do you know how much a scoop (of undisclosed size) of detergent weighs? And the weight for a given mass varies from product to product. I suggest that except for 13 products, you cannot know unless you have used the products previously and carried out your own assessment. Note that almost as many front loader doses are as high as top loaders based upon manufacturers' directions. With a smaller volume of water in the front loader wash cycle, we will see later that the higher rate of salinity can be a significant problem in the wash water. All the products tested were from freshly opened packets. Other than the moisture content at the time of manufacturing, a small amount of water may have been absorbed from the atmosphere between manufacture and packet opening. Moisture content ranged from 1.4% to 28.7% (based on oven-dry weight) for an average of 6.4%. That means, that on average you are paying for 6% water (assuming moisture same at packing). If you are paying $4.00 per kg, then a 6% moisture content is equivalent to $0.24 for the water (or $4.00/L). NP - no added phosphorus, although minor amounts of phosphorus may be present from the other compounds from which the product is made. Products with less than 0.05 g/wash were considered to be consistent with this symbol. P is a maximum level of 7.8 g phosphorus per wash as self-imposed by the manufacturers. The reason the level is set at 7.8 g is not clear as at this rate it equates to about 310 mg P/L in a top loader wash, or 130 mg P/L in a top loader wash cycle. The NSW EPA licence requirement for discharge of wastewater from a sewage treatment plant is 0.3 mg P/L. n/s No symbol or not stated - some brands had no information that could be used to determine the likely phosphorus contribution from the product prior to testing. That a product has no phosphorus is not an endorsement that the products is any more environmentally "friendly" than a product with levels up to the top of the "P" range (7.8 g/wash). Phosphorus replacement chemicals, not identified on the labels, may have other impacts upon the environment that have never been assessed. Zeolite is a phosphorus replacement mineral that is unlikely to be an environmental hazard in soils, but may be a problem to filter systems. Other 'nonsense' advertising included comments that the product contained no 'hydrocarbons' or 'not animal tested'. I consider the term "environmentally friendly" as a warm and fuzzy comment proliferated by people and groups who have no idea of the potential impact of these detergents on the environment. In my opinion, laundry detergents can NEVER be friendly, irrespective of how little detergent is used. Products may have 'low environmental hazard', but never 'friendly'! The scientific effect of sodium on plants and soil has been known for many decades and an awareness of salinity in the broader community is gaining momentum every day as salinity issues now impinge upon urban as well as rural areas. However, the implications of salinity and sodium in laundry detergents has been ignored at most levels of government and the manufacture and sale of products that will end up in municipal sewage treatment systems has been condoned by regulators (by default). The use of some laundry detergents, where the greywater is being used on urban gardens and lawns, has serious environmental outcomes, yet the public are being refused the right to know of the amount of sodium in common household products. The same failure to identify sodium in commercial cleaning products is common. There is NO labelling on any laundry detergent that has been examined in this research project (71 powders) that will give the consumer any reasonable understanding of the likely effects of salinity or sodicity from use of the product or the likely environmental consequences of discharging greywater onto lawns, gardens, pot plants or even bare soil. Since the last research, several products are now promoting "low sodium", which is a start! High sodium levels will ALWAYS have an impact upon sensitive plants and in susceptible soils are likely to lead to soil structural instability. What is 'high' sodium will depend upon the application rate (litres per square metre), frequency, periods between application such that rain may leach sodium deeper into the soil profile as well as the soil type and conditions. Rather than simply pouring liquid or powder detergents over the clothes and hoping they will mix early in the wash, the preferred method is to firstly dissolve the product in water and then pour this cocktail into the machine when there is some water in the bowl. In a top loader, you can pour the dissolved detergent just as the agitation starts. Some machines have special detergent dispensers to mix the detergent at the optimum time in the wash cycle. Percolation is the movement of water through a soil. Infiltration is the movement of water into the soil, such as infiltration during rain. The water that enters the soil then continues a movement either sideways or downwards under the forces of gravity or in any direction by capillary forces, including upwards in response to evaporation at the soil surface. When laundry water is placed on soils, the impact of the chemistry of the water may be serious. In the photograph below, five soils were each subjected to rain water (clean water) and laundry water (mixed at wash cycle dose). Notice the variability in the throughflow - the water captured in the jar under the soil. In four out of five cases, less laundry water percolated through the soil for the clean water. Secondly the colour of the laundry water percolate showed that the organics from the soil were pushed out to give the soil a darker colour. This colour indicates that the organics (plant nutrients) can be made soluble and therefore leached from the soil. Of course, laundry detergents are manufactured so that they do remove soil from our clothes. the soil loading rates and frequency of discharge; and the vegetation growing on the discharge area. ©Copyright: Lanfax Laboratories PO Box 4690 Armidale NSW 2350.